This week’s group of newcomers to the Etsy Ireland team show a fantastic variety of skill, motivation and inspiration. From rockin’ 40’s dolls, to funky coffee tables; and from mouth-watering bath salts, to stitching that will make you go Ahhh…..talent from across Ireland is represented this week. What struck me as I explored the shops of each recently joined member, was the common theme that seemed to flow. Motivating so many of our new members, and indeed many of our existing members, is a love to create from a young age. It is wonderful to see items created with love and care, but it is extra special to know, that the creator has been dreaming up their craft for years and years. That for me is a creation that truly comes from the heart. And for that reason I have named this week’s New Member’s Treasury ‘Heartmade’ in Ireland. TrashMagic – a beautiful collection of unique and creatively designed earrings. There is an unmistakable love for the craft in this shop and I’ve chosen a fabulous pair of Bright Orange Metal Rose Earrings to feature in the treasury. Once off items tailored to your taste also available! Belle and Bow Designs is a shop dedicated to all things pretty and practical. From a background in ceramic design, Fiona is a lover of all things arts and crafts, fashion and photography. She has lovingly hand-stitched each piece in her shop including the cute padded E-book sleeve for Kindle 4, 5, Touch and Paperwhite I have chosen to feature in this week’s treasury. Custom orders also available for your device! How handy is that! Handmade Cards by Lucy - Lucy makes the prettiest handmade vintage inspired greeting cards. The one I have chosen is a sweet floral pastel design; perfect for any occasion. DecadeDollies – inspired by the classic feminine style and designs from the turn of the century right up to the swinging 60's, Decade Dollies came about by chance, when Anita from Dublin saw a photo of her Nana Maggie taken in the 1940's, and decided to recreate her in doll form. Since then she has been creating unique vintage inspired cloth dolls. If you know someone for whom you would like to create a wee doll version of for a special gift, Anita offers bespoke design. Crafty by Lola brings us statement fashion jewellery. Lola says she is ‘Born to make stuff’, so it is no surprise that ended up living next door to a craft shop! This makes it very convenient when she is busy at home making jewellery, accessories, fascinators (headpieces), greeting cards & invitations. One of those designs is a Metal Circular Bracelet with black leather band, with a choice of chain, clasp or knotted finish. The name Lucciola by Betty comes from the Italian word ‘Lucciola’ meaning ‘firefly’, and ‘Betty’, what owner Bethan is called by her friends. So simple and pretty. This shop has a colourful selection of pouches and purses, and clever little embroidered quotes. 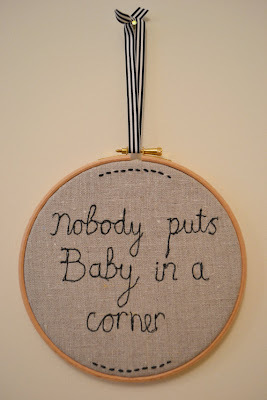 My favourite is a 7 inch embroidery hoop featuring the famous "Nobody puts baby in a corner" quote from Dirty Dancing. Perfect for a wall hanging. When I read Natasha from Hunny Beeds’ story I have to admit I was quite envious! From Ireland originally, Natasha now lives in Spain and has turned her love of creating into not one, but three Etsy Shops. 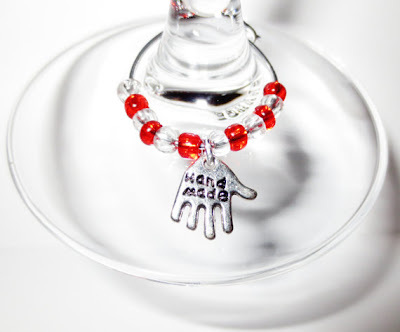 Hunny Beeds is a collection of bright and pretty jewellery using fresh and feminine designs. Natasha’s other two Etsy shops, Gvega (ceramic wall art, murals, mosaic tables and tiles) and Toriart (ceramic garden art and decorative wall art), are equally refreshing. Iroha Kitsch – gorgeous crochet hats, bags, throws & knits you just want to snuggle into! Yuconno, Japanese by origin, but now in Ireland, lucky for us, as her knits are truly lovely. I especially like this hand crocheted orange hat made with 100% linen. Bath Time Bliss – If I told you about mango, papaya, peach, strawberries and vanilla you may not expect me to go on to tell you about beautifully crafted artisan organic soap made by Mariel from Dublin. However the benefits and nourishing properties of fruits and herbs make these the most obvious ingredients to treat your body. My favourite here are the trio of Epsom bath salts containing Geranium, Rose Petals, Lime, Lemongrass & Apple, Mango & Papaya. Simply scrumptious! Saunderson Road is a small furniture making business located on the outskirts of Belturbet, Co. Cavan. The pieces in this shop are truly original – I can be sure you have not seen coffee tables like this before. And that is what Saunderson Road set out to do – to make furniture that stands out from the rest. 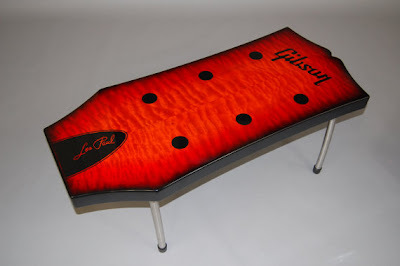 Take for example the Gibson guitar inspired maple top coffee table in a glowing "Lava Burst" colour. Ula Design – Polish native Ula, living in Ireland since 2004, trained as an architect and explored contemporary art design for years before shifting direction to jewellery design. She now offers a uniquely designed collection of jewellery one piece of which I have chosen for this week’s treasury because I loved the use of natural stone and asymmetric design – and the bright orange colours. 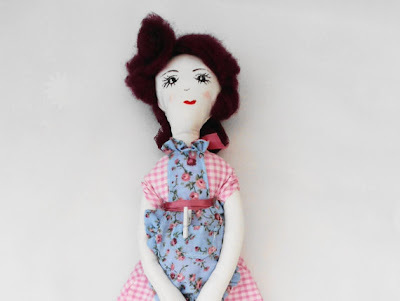 MissDaisy Dolls – borne from a passion for doll making, creating characters and storytelling, Miss Daisy Dolls is a true tail of ‘what I want to be when I grow up’! A childhood love has been transformed into a real life job. A sample from the collections of handmade dolls is the Emma Jane Doll; sewn from a bespoke pattern and is one of kind, unique in hair / eye-colour and clothing variation. Lets give a warm welcome to all of our new team members and share the love with some hearts! What a friendly work Amy ,thanks for introduction ..lovely ! I know Ula..sure all of they are happy with such welcome .